This experiment to compare the available motion analysis system was conducted by Dr. James G. Richards, Ph.D. from the University of Delaware, Newark DE. 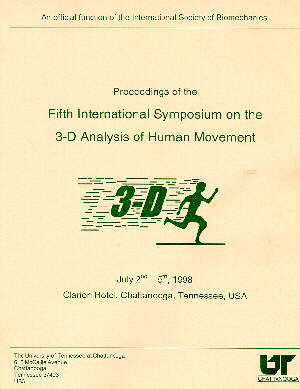 Dr. Richards was assigned the task to compare as objectively as possible all the existing motion analysis systems and present it at the 3D Conference of Human Movement. The 3D conference is an official function of the International Society of Biomechanics (ISB) and is considered to be the most credible and influential in the field of Biomechanics. The experiment was conducted and the results of this study were presented with no interference from the companies whose products were tested. Dr. Richards selected customers sites to conduct the experiment. In a few cases, such as with Elite and CODA, results were returned to the companies' headquarters to determine the source for the results which were accessibly inaccurate. The results of this study were presented at the 3D Conference of Human Movement at the University of Tennessee, Chattanooga, Tennessee. July 3rd, 1998. The title of Dr. Richards' paper was: "The Measurement of Human Motion: A Comparison of Commercially Available Systems." The article published in the Proceedings were only some preliminary results and many of these findings were incorrect. The correct, up-to-date results were presented during the oral presentation and in the final paper by Dr. Richards. The clarification of results between the preliminary, pre-Conference publication and the appropriate, up-to-date results were particularly important for a video based system such as the APAS system. For the APAS system, the initial results were based on data obtained from only 2 cameras which was inappropriate for an experiment utilizing the experimental test device. The test device had a mechanical arm which rotated 360 degrees and, therefore, obviously required a minimum of 5 cameras in order to see each marker from at least two cameras views. Restricting the data collection to only two cameras created some peculiar situations such that nearly 176 degrees of motion were detected by one only camera, 112 degrees by two cameras, and the remaining degrees were undetected by any camera. Because of the specific conditions inherent with this test device, the experiment had to be repeated utilizing 5 cameras. All other venders used 6 cameras. The final paper that was presented, included 5 cameras which is the only way to be able to analyze this particular device. All the other companies used 6 cameras and even using 6 cameras, two of the companies could not produce reliable and valid results. However, with normal, straightforward experimental testing of human movement, three cameras and, frequently only two cameras, are adequate with the APAS system. The slides utilized here were taken with digital camera during Dr. Richards' presentation. Therefore, the quality of the slides were affected by the angle from where the pictures were shot during the presentation. In no way has Dr. Richards supported, condoned, or contributed to this article on our web site. Since the presentation was delivered publicly in an international conference, the material was deemed to be in the public domain and we are pleased to have the opportunity to present these results here. "The purpose of this study was to critically review and analyze the available commercial systems in light of their ability to generate basic coordinate data, and to provide information regarding the advantages or disadvantages of their unique characteristics." The tests utilized a device that systematically moved markers within the measurement system's calibrated space in order to acquire approximate measures of system accuracy and efficiency. This setup required a minimum of 5 cameras situated at particular angles in order to see each marker with at least 2 cameras. However, in some cases, the resultant video provided views which, for a few frames, some markers could be seen from only one camera. Although the other systems utilized six cameras, the APAS system utilized only five cameras. In spite of this difference, the APAS was able to interpolate the points and yielded excellent results. 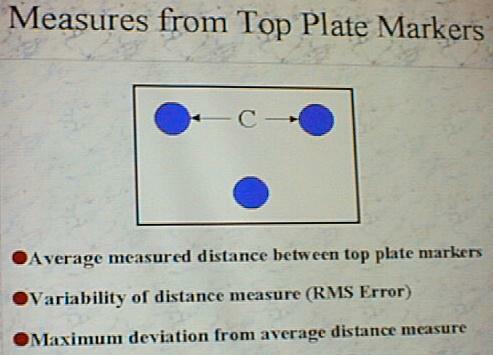 Slide 2 illustrates an original presentation slide which described the testing procedures. The Ariel System used 5 Cameras while all others used 6 cameras. The Elite and CODA Systems were unable to produce reliable results, in most cases, and, therefore, were not included in this report. 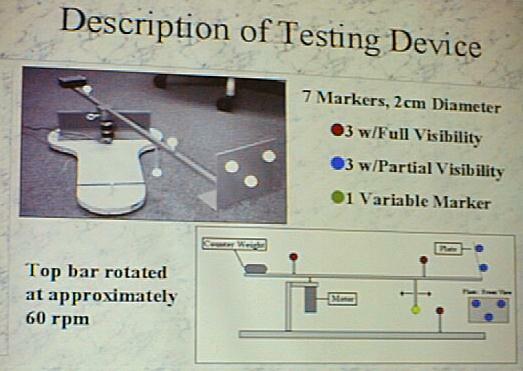 The testing device, which can be seen in other pictures, supported seven markers. Two markers were place 50 cm apart on top of a rigid aluminum bar that rotated in the horizontal plane at a rate of approximately 60 rpm. Three markers were placed in a triangular pattern on a plate mounted vertically at the end of the bar. The plate was perpendicular to the bar and the markers were placed on the outside surface so that they were only visible to the subset of cameras as the bar rotated. A sixth marker was mounted to the base of the device on a 3-cm rigid post. The final marker was mounted to a post on the bottom of the rotating bar. The post placed this marker at the same height as the stationary base-mounted marker. The position of the marker below the bar was adjustable along the length of the bar so that the minimum distance between the stationary marker and the orbiting adjustable marker could be controlled. Deviations from known distances between fixed markers and deviations from known angles were determined for each of the systems measured. 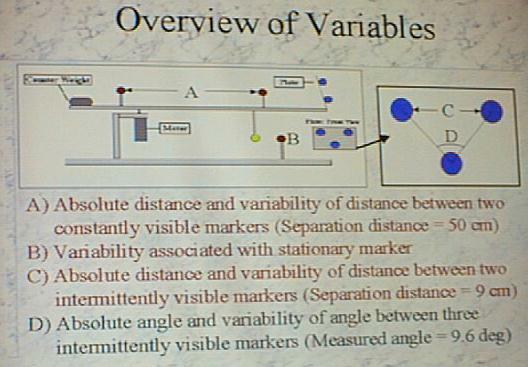 Slide 3 illustrates the original slide from the presentation at the 3D conference, describing the various variables utilized in the study. 1. 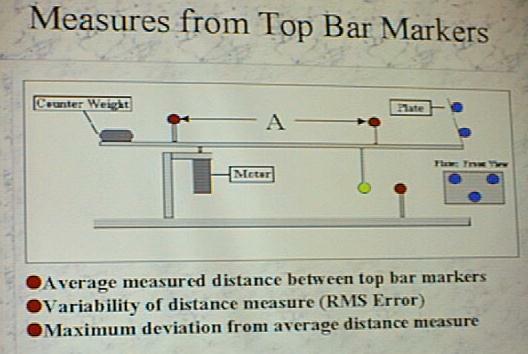 The measured distance between the two markers on the top of the rigid bar was calculated for each frame of the trials. Measured distances were averaged within each trial and subtracted from the known distance of 50.00 cm to produce an average absolute error associated with each of the systems. Noise associated with this measure was determined by taking the RMS of the difference between the average measured distance and the measured distance in each frame of the data. 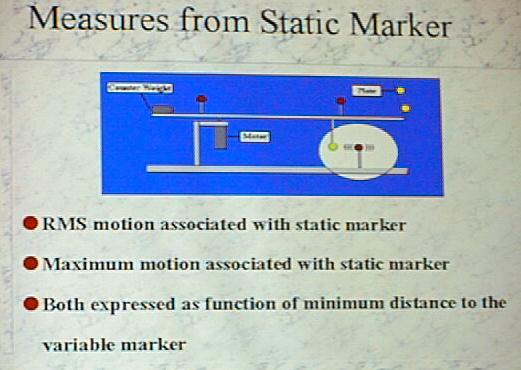 Slide 4 was photographed in the original presentation and illustrates these measurement parameters. 2. The measured distance between the two markers on the top to the plate was calculated for each frame of the trials and compared to the known distance of 9.00 cm to produce an average absolute error associated with each of the systems. The maximum absolute error associated with the distance calculation in each trial was also recorded. 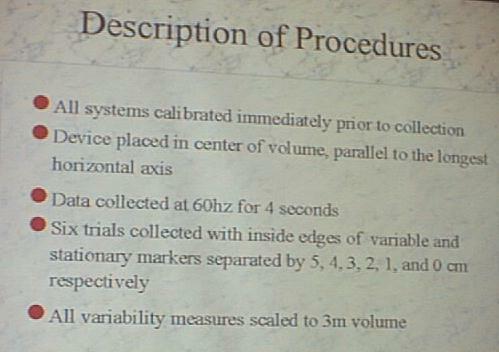 Noise associated with this measure for each trial was determined by calculating the RMS. Slide 5 was taken at the original presentation and illustrates these measurements. 3. 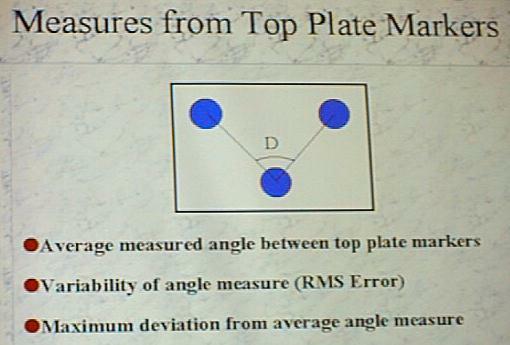 The three markers on the plate were used to define an angle with the bottom plate marker serving as the vertex of the angle. The angle formed by the three markers on the plate was calculated for each frame of the trials. Measured angles were averaged within each trial and subtracted from the known angle of 95.80 degrees to produce an average absolute error associated with each of the systems. In addition, the maximum absolute error associated with the angle calculation in each trial was recorded. Variability associated with this measure for each trial was determined by taking the RMS of the difference between the average measured angle and the measured angle in each frame of the data. Slide 6 was photographed at the original presentation and shows the angle. 4. The variability associated with the stationary marker measurement was determined by calculating the RMS of the difference between the average stationary position and the measured stationary marker position in each frame of the data. Slide 7 illustrates the original slide photographed at the presentation and shows the measures from the static marker. Generated on 4/22/2019 11:08:43 AM (PST) ADI/HQ/GBA/2019/ARIELCLOUD/v3.0.2018.0126.